Study with us for 4 weeks or more on our Total English or Total English plus courses and enjoy 33% OFF! All the English you need - for work - for leisure - for life! General English and Cambridge English Exam Preparation available. Offer valid for courses booked and taken between 7 January and 21 June 2019. Payment in full at time of booking. Discount applied to course fees only (i.e. not on registration, accommodation and other associated fees). Bookings subject to our usual terms and conditions. Cannot be used in conjunction with any other offer. Places offered subject to availability and pre-course testing. Offer may be withdrawn at any time, without notice. Valid for both junior and adult summer courses. Only available when 3 or more students register and pay at the same time. Offer valid for summer-course bookings only, June-August. Discount applied at point of registration. Bookings subject to our usual terms and conditions. Cannot be used in conjunction with any other offer. Places offered subject to availability and pre-course testing. Offer may be withdrawn at any time, without notice. Visiting with 15 or more students? You're eligible for group discounts! 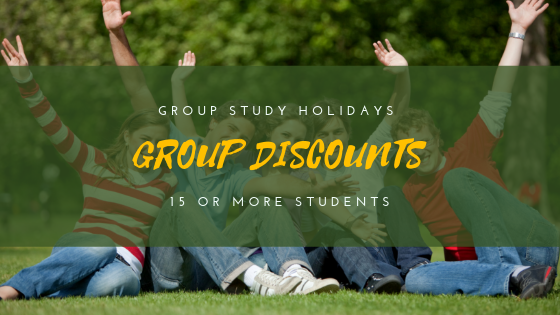 Visit our Group Study Holidays page for more information or contact us for a quotation. Discounts are offered for groups of 15 or more students. All students must arrive/depart on the same date and, if airport transfers are included, students must all arrive/depart on the same flight. Volume discounts are offered in brackets of 15-30, 31-45 and 46+ paying students. Bookings subject to our GSH terms and conditions. Cannot be used in conjunction with any other offer. Places offered subject to availability and pre-course testing. Offer may be withdrawn at any time, without notice.